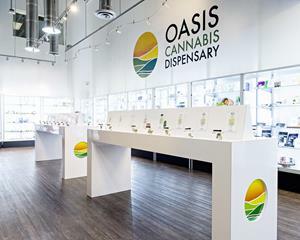 LAS VEGAS, NV, April 04, 2019 (GLOBE NEWSWIRE) -- via NEWMEDIAWIRE -- Since acquiring Oasis Cannabis Dispensary in Las Vegas, Nevada, CLS Holdings USA, Inc. (OTCQB: CLSH) (CSE: CLSH.U) has been working to elevate the entire customer experience behind cannabis. The catchphrase “New Oasis, Same Faces” assures customers that they will still receive the same care and attention they’ve come to expect from Oasis Cannabis, only now in a totally redesigned, modern, and fresh facility. The new space is more accessible, inviting and vibrant, with the same friendly and knowledgeable staff. Over the past few months, walls have been torn down and the color scheme have been modernized from lime green to bright white with blue accents, evoking a vibrant and calming feel. LED lit display cases are purposefully and openly situated, allowing customers ample room to explore products. The large white bud bar hosts the budtender, who is able to curate a better user experience through education and a diverse product selection. At the heart of the renovation is improving customer experience – but the company’s dedication to education, compassionate care, and community enrichment remain the same. All are welcome to join the Oasis Cannabis Grand Reopening Party, which will take place at the dispensary on Saturday April 6th 2019 from 12:00pm – 10:00pm. The event will feature vendors on-site, live art, live music, food trucks, and special prices. The dispensary is located at 1800 Industrial Rd #180, Las Vegas, NV 89102. Founded in 2017, City Trees is a Nevada based cannabis cultivation, production and distribution company. Offering a wide variety of products with consistent results, City Trees is one the fastest growing wholesale companies in the industry. Its products are now available at 40 dispensaries. This press release contains certain “forward-looking information” within the meaning of applicable Canadian securities legislation and “forward-looking statements” as that term is defined in the Private Securities Litigation Reform Act of 1995 (collectively, the “forward-looking statements”). These statements relate to anticipated future events, future results of operations or future financial performance, and anticipated growth. In some cases, you can identify forward-looking statements by terminology such as "may," "might," "will," "should," "intends," "expects," "plans," "goals," "projects," "anticipates," "believes," "estimates," "predicts," "potential," or "continue" or the negative of these terms or other comparable terminology. These forward-looking statements are only predictions, are uncertain and involve substantial known and unknown risks, uncertainties and other factors which may cause our actual results, levels of activity or performance to be materially different from any future results, levels of activity or performance expressed or implied by these forward-looking statements. We cannot guarantee future results, levels of activity or performance and we cannot guaranty that the proposed transactions described in this press release will occur. You should not place undue reliance on these forward-looking statements, which speak only as of the date that they were made. These cautionary statements should be considered together with any written or oral forward-looking statements that we may issue in the future. Except as required by applicable law, we do not intend to update any of the forward-looking statements to conform these statements to reflect actual results, later events or circumstances or to reflect the occurrence of unanticipated events. See CLS Holdings USA filings with the SEC and on its SEDAR profile at www.sedar.com for additional details.